Located in a rural area Flowers & Thyme is a bed and breakfast in the heart of Pennsylvania Amish country "where thoughtfulness and hospitality bloom." 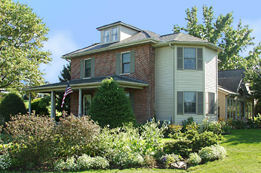 Flowers & Thyme B&B offers elegant simplicity with relaxing country style accommodations. Polished yellow pine or hardwood floors, rugs, and eclectic blend of furnishings and collectibles accent bright colorful rooms. We offer three rooms with private baths ensuite, each with different decorations and views. A comfortable room with a canopy bed, a fireplace, or a 2-person Jacuzzi can be chosen. Colorful gardens bloom from early Spring to late Fall in varying hues of pink and pastels. We've been featured in Birds and Blooms Magazine. Dinners with an Amish family can be arranged. We are located east of Lancaster city, close to the Sight & Sound and American Music theaters, the outlets, Strasburg train museum, and the many Lancaster County attractions that make this area unique. This and other Lancaster County Bed and Breakfast Inns can be found here online in The Register. Romantic Country Inns and B&Bs offer a great lodging alternative to big hotels.